I've recently overhauled my creative process to include more non-digital, physical elements that you can actually touch, feel and hold. I've been using Pinterest boards for years, but somehow physical mood boards got lost along the way and I'm resurrecting them. I start the design process with a consult with my client - on-site or sometimes over phone/Skype for e-design clients. During that process I get a sense of my client's style, wishlist, site issues and budget and develop a concept statement or brief. I'll start gathering objects and images for inspiration and start putting together a mood board. Coastal - Modern - Organic - a good start to my mood board that holds the concept. Now I'll move onto a concept plan that integrates my site inventory, concept and client's wishlist. From here I'll meet with the client to review the draft and then move from lovely hand work to the computer, to draft plans and details, and develop 3D models when requested. Thanks for coming along on the studio tour today! Spring: the bird’s are singing, the snow’s melting and our landscapes are coming back to life. For a landscape architect it’s the time of year when the inbox and voicemail are over-flowing with requests for landscape design services. Designers have time. Architects and designers are booked solid in the spring when we get the most influx of residential projects. If you book in the fall, we actually get to take days off, so we’ll have more quality time to spend with you. Contractors have time. If you speak with a good contractor in May, they are likely booked through August. With a shovel-ready design, you can get the contractor you want by doing your homework now. Quotes take time. Before you book a contractor, you’ll want several quotes because they can vary greatly (your designer can do this for you if you work with them through project management). The quote process itself can take several weeks. Your garden is in its full glory (or chaos) in early fall. If you live in a temperate climate, your plants are likely just leafing out in May, sometimes late May, so there’s lots of negative space. When we do a site analysis in fall we can see how your garden looks at maturity - there are no hiding its issues. September is the new January. You’ve probably heard this one before. September is a great time to start new projects. There’s energy, crispness and momentum this time of year. The entire process - design/bid/build - takes time. And since your garden takes its time showing its true colours, fall really is the time to start if you want to be sitting in your outdoor space next July - hosting an al fresco dinner party, watching the kids play or kicking back with a good book in your personal oasis. Ange Dean is the principal landscape architect at Land Studio East. She creates meaningful gardens and landscapes throughout Nova Scotia and beyond. Join our list for updates on our forthcoming distance landscape design service. Let’s be frank, perhaps the best thing about garden tours is getting to poke around every last corner of a stranger’s property. Maybe even that dreamy garden that almost makes you cross the yellow line every time you drive by. Or maybe that’s just me and my questionable driving skills. Garden tours are also a great way to get inspiration for your garden, see what grows well in your area and meet local plant lovers. I recently attended the Chester Seaside Garden Tour in lovely Chester, NS. Here are some of my favourite moments from the gardens I visited. Garden 1. The first garden on my list was all about sweeping perennial beds. As I wandered to the back of the garden, I took notice of the owner’s great vegetable garden, integrated into the ornamental beds, with lots of flowering herbs and bean teepees for vertical interest. Then I saw a visitor slipping into a foot-wide pine needle path into the wooded area - the garden kept going and going. The first event on the path was the compost area tucked behind a think hemlock hedge, as I continued along the perennial-lined path, I reached the very back of the garden and met the owner in her tucked-away greenhouse. I was surprised to find this property hadn’t been professionally designed - She did a great job of designing this cohesive and evocative garden on her own. Take-away: The value of intrigue, and keeping some things hidden. Garden 2. Next on the tour was the Risley Greenhouses. I thought this might be a commercial facility, but the complex with heated tropical greenhouses - a smaller replica of the greenhouse at Kew, a kitchen garden, cutting garden, maze and stroll gardens supports the activities of a residence with frequent guests. The main greenhouse is dedicated to tropicals with one of the wings full of vegetables for the kitchen garden. The garden features patios of local Scotia slate and crushed gravel paths that lead through gorgeously oriented kitchen and cutting gardens. The property was absolutely immaculate and a treat to visit. Garden 3. The next garden was in a woodland setting and included many specimen plants, a thyme lawn, pond, and dry gardens, as well as many woodland garden areas. The owner did a fantastic job integrating her cottage-style veggie garden into the larger property with teepees and foxglove, using espaliered fruit trees and providing so many private seating areas. I think my favourite element was the flawless thyme lawn. It was positioned to elicit scent on the way to a seating area, but I think it was the perfect spot for a nap. Take-away: Don’t forget to include private and social spaces in your garden. Garden 4. The next garden was just footsteps from the harbour with extensive stonework and perennial gardens on a small, steeply sloping site. The design made good use of the slope with seating terraces at varying levels and a driveway at the very top, screened by a hedge of highbush blueberry. The owners commented that the garden was perfect for them, because it was incredibly low maintenance. The designers won with this one - lots of variation and interest, while keeping things simple and elegant. Take-away: Use challenges to your advantage - create terraces to make the best use of a sloping site. Garden 5. Darn, I missed #5. Sorry! Garden 6. A short drive to Chester Basin led to an elegant garden with seaside views. The property gently slopped to the water with several perfectly positioned seating areas adjacent to the house. Take-away: Roofless ‘pergolas’ are perfect in a cool, foggy climate to maximize sun. Garden 7. The last garden of the tour made great use of plants that love hot, dry, rocky places. As well, there was an obvious love of daylilies as we saw gracefully curving, well-labelled beds dedicated to these plants. What stole the show was the dry garden with lavender and Russian sage. Take-away: Plants will always perform best if you give them their native environment. Thanks for coming along on my tour. And thank-you to all the gardeners who opened their homes to their fellow curious gardeners. Ange Dean is the principal landscape architect at Land Studio East. She creates meaningful private and public gardens and landscapes that get people outside to experience the restorative benefits of nature. Dine by Design East is a juried dining space design show similar to Dinner by Design in Vancouver, Calgary and Toronto. 10 designers were selected to create dining spaces within a 10’ x 10’ space. Various events took place over the long weekend - including the opening gala – where designers were paired with top local chefs who created menus that reflected their dining space. In collaboration with Herringbone Design, we thought the event would be a great lab for experimenting with ideas and materials, and expanding our circle within the design community. What a tremendous amount of work, but we had an amazing time and met so many great people, and proceeds went to a design scholarship to NSCAD University. We can't wait to see this year's line-up! While we believe great landscapes are timeless and enduring, garden design needs to stay relevant - to keep moving forward in conversation with art, architecture, fashion and the rest of the world of art and design. Eco-Chic - Ecological gardens (organic, wildlife habitat, low water, native plants) have been popular for sometime and are here to stay. In 2015 we predict these gardens go chic. No more ‘natural’ excuses for a disorderly yard. Good design has universal appeal, so let’s bring beautiful ecological gardens to the masses. Marsala - Pantone colour of the year for 2015. We love it! 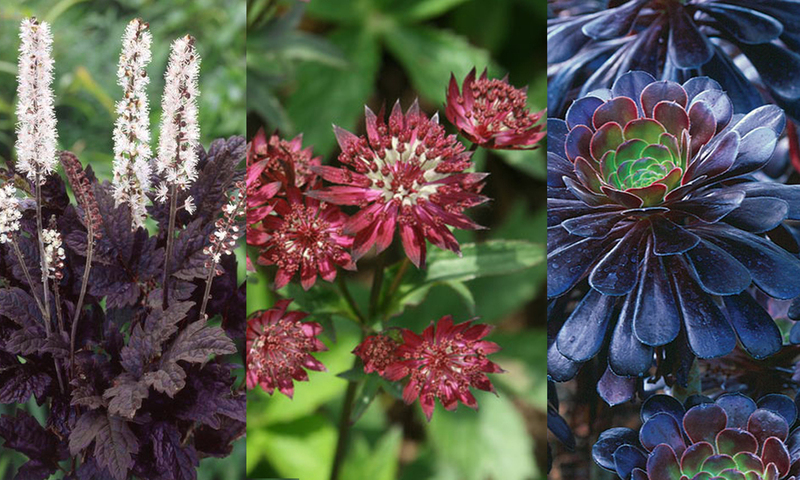 Try this ‘earthy red wine’ on a throw, cushions, or with bold plant choices like Aeonium, Hellebores x hybridus ‘Red Lady’, Astrantia major ‘Ruby Wedding’ or Cimicifuga racemosa ‘Brunette’. Outside | Inside - Bring the inside out and the outside in. Even in cold-climates. Quality exterior furnishings move into our outdoor rooms and plants (living walls, tropicals, succulents) bring their may benefits - improved air quality, mood and concentration - inside. Smoky Glass - Named a 2015 trend in interior design, try it on sconces, railing panels and glassware. A modern retake on 70’s style. Anti-Viral Gardens - 2014 was a big year for viruses (ebola, enterovirus 68). Conventional medicine has little support for viral infections, so it’s time to take matters into our own hands. We’ll be planting elder, Chinese skullcap and licorice in our garden. Pick up emergent viral expert Stephen Buhner’s book for inspiration on what you might want to plant in yours. Bachelor Gardens come on to the scene with the popularity of cocktail and brewer’s gardens, foodie culture and the rise of the weekend chef. Your dude needs a space to grow hops for his home brew, green coriander for your cocktail and a place to perfect his fire-keeping and BBQing skills. We hope we’ve opened a space in your mind around what a garden could and should and might actually be, in 2015. As always, if you need help along the way, we’d be delighted to work with you! (Check out the International Garden Festival for great forward-thinking gardens).